You will earn 6,680 Reward Points. Earn 1 reward point for every 1 dollar spent. Heavy duty doors and door latch mechanisms. Generator pan is stainless steel with stamped water level line. Efficient steam generating system, requires no water or drain connection. C24EO5 is shipped for 208 or 240 volt, 60 Hz, 1 or 3 phase. Phase is field convertible. Voltage is NOT field convertible. C24EO3 is shipped for 208/60-50/3 electrical service. Can be field converted to 208/60-50/1 and 240/60-50/3 and 240/60-50/1. Controls include three position control switch (timed cooking / Off / constant cooking). 60 minute timer. Low water light and audible signal. Solid sheathed tubular elements (8 KW)(12 KW) embedded in 1" thick cast aluminum sealed to pan bottom with thermal transfer compound for even heat distribution. 480 volt, 60 Hz, 3 phase power supply, includes step down transformer. Casters for open leg stand. 28" open leg stand with 24" x 28"h pan slides. 34" open leg stand with 24" x 28"h pan slides. Set of two universal pan slides for open leg stand. Pull-out 12" x 20" sliding shelf (cooking compartment). Stacking kit for two units with hardware, counter mount. 2 1⁄2" deep (solid) (perforated). 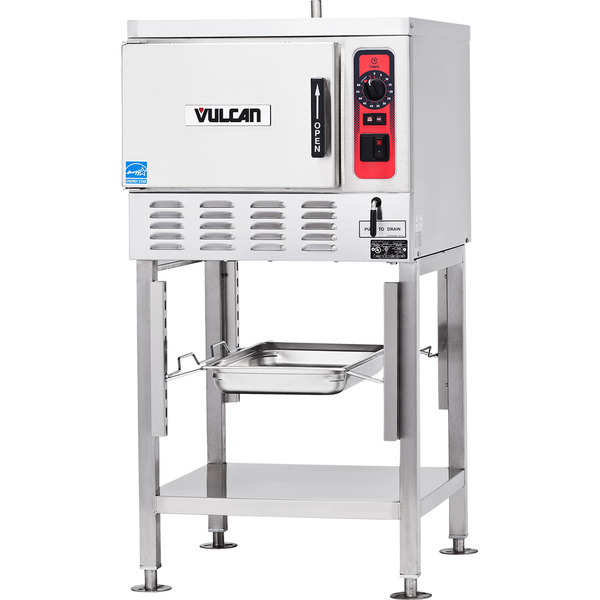 Single compartment electric connectionless steamer, VulcanHart Model No. C24EO. 304 stainless steel exterior. Stainless steel cooking compartment. Generator pan is stainless steel with stamped water level line. Efficient steam generating system requires no water or drain connection. Solid sheathed tubular elements embedded in 1" thick cast aluminum sealed to pan bottom with thermal transfer compound for even heat distribution. Controls include three position control switch (timed cooking / Off / constant cooking). 60 minute timer. Low water light and audible signal. Heavy duty doors and door latch mechanisms. Power required 208 or 240 volt, 60 Hz, 1 or 3 phase. Phase is field convertible. UL listed. Classified by UL to NSF std. #4. Meets ENERGY STAR® performance levels.